Scars are visible signs that remain after a wound has healed. They are the unavoidable result of injury or surgery, and their development can be unpredictable. Poor healing may contribute to scars that are obvious, unsightly or disfiguring. Even a wound that heals well can result in a scar that affects your appearance. Scars may be raised or recessed, different in color or texture from surrounding healthy tissue or particularly noticeable due to their size, shape or location. Scar Revision is plastic surgery performed to improve the condition or appearance of a scar anywhere on the body. Scar revision is meant to minimize a scar so that it is more consistent with the surrounding skin tone and texture. Treatment options at our Birmingham, Alabama plastic surgery center vary based on the type and degree of scarring. They can include simple topical treatments, minimally-invasive procedures and surgical revision with advanced techniques in wound closure. You are bothered by a scar anywhere on your body. You do not have active acne or other skin diseases in the area to be treated. Discoloration, surface irregularities and other more subtle scars can be cosmetically improved by surgery or other treatments recommended by your plastic surgeon. These types of scars do not impair function or cause physical discomfort. They include acne scars as well as scars resulting from minor injury and prior surgical incisions. Hypertropic scars are thick clusters of scar tissue that develop directly at a wound site. They are often raised, red and/or uncomfortable. Hypertropic scars may become wider over time. They can be hyperpigmented (darker in color) or hypopigmented (lighter in color). Keloids are larger than hypertropic scars. They can be painful or itchy and may also pucker. They extend beyond the edges of an original wound or incision. Keloids can occur anywhere on your body, but develop more commonly where there is little underlying fatty tissue, such as on the face, neck, ears, chest or shoulders. Contractures are scars that restrict movement due to skin and underlying tissue that pull together during healing. They can occur when there is a large amount of tissue loss, such as after a burn. Contractures can also form where a wound crosses a joint, restricting movement of the fingers, elbows, knees or neck. By choosing a member of the American Society of Plastic Surgeons (ASPS) for your scar revision procedure, you can be assured that you are choosing a highly-trained, board-certified plastic surgeon. ASPS Member Surgeons must meet rigorous standards for training, ethics, physician practice and research in plastic surgery. Examine your scar in detail. Discuss likely outcomes and any risks or potential complications. At your consultation, it is very important to to ask questions about your scar revision procedure. It's natural to feel some anxiety, whether pre-treatment stress or excitement about your anticipated new look. Don't be shy about discussing these feelings with your plastic surgeon. The decision to have scar revision surgery is extremely personal. You will have to decide if the benefits of scar revision will achieve your goals and if the risks and potential complications are acceptable. Your plastic surgeon and/or staff will explain in detail the risks associated with surgery. Damage to deeper structures (including nerves, blood vessels, muscles and lungs), which may be temporary or permanent. Allergies to tape, suture materials and glues, blood products, topical preparations or injected agents. Possibility of revisional surgery or staged procedures. You will be asked to sign consent forms to ensure that you fully understand your scar revision procedure, the alternatives and the most likely risks and potential complications. Avoid taking aspirin and certain anti-inflammatory drugs and herbal supplements, as they can increase bleeding. Scar revision surgery may be performed in your plastic surgeon's of?ce, an accredited of?ce-based surgical facility, an ambulatory surgical facility or a hospital. Your plastic surgeon and assisting staff will fully attend to your comfort and safety. Anesthesia choices for scar revision include local anesthesia, intravenous sedation and general anesthesia. Your doctor will recommend the best choice for you. The degree of improvement that can be achieved with scar revision will depend on the severity of your scarring and the type, size and location of the scar. In some cases a single technique may provide significant improvement. However, your plastic surgeon may recommend a combination of scar revision techniques to achieve the best results. Topical treatments such as gels, tapes or external compression can help in wound closure and healing, or to reduce the ability of skin to produce irregular pigment. These products may be used to treat existing surface scars and discoloration, and to aid in healing of scar revision procedures. Injectable treatments are often used to fill depressed or concave scars. Depending on the injectable substance used and your particular scar conditions, results may last from 3 months to several years. Therapy must be repeated to maintain results. One form of injection therapy uses steroidal-based compounds to reduce collagen formation and can alter the appearance, size and texture of raised scar tissue. Dermabrasion, a mechanical polishing of the skin. Laser or Light Therapy, which causes changes to the surface of the skin that allow new, healthy skin to form at the scar site. Chemical Peel solutions, which penetrate the skin's surface to soften irregularities in texture and color. Skin bleaching agents, which are medications applied topically to lighten the skin. For deeper scars, an incision is sometimes needed to surgically remove the old scar. Tissue Expansion can be a substitute for skin grafts. In this procedure, an inflatable balloon called a tissue expander is placed under the skin near the scar site. Over time, the balloon is slowly filled with sterile solution to expand the area of healthy skin. Once the skin has been stretched sufficiently, the expander and the scar are removed and the stretched skin is moved to replace the scar tissue. This process can involve multiple surgical stages or procedures in order to achieve the final results. How to care for yourself following surgery. When you go home, seek medical attention immediately if you experience shortness of breath, chest pains or unusual heart beats. Should any of these complications occur, you may require hospitalization and additional treatment. The initial healing phase of a surgical scar revision may include localized swelling, discoloration or discomfort and may take 1 to 2 weeks. Healing will continue for several weeks. As the new scar heals, it will slowly refine and fade. With dermabrasion, chemical peel or laser resurfacing, you will experience similar conditions at the treated area in addition to overall sensitivity. The final results of your scar revision surgery will be long-lasting. However, it may take several months for your final results to become apparent. In some cases it may take a year for the new scar to fully heal and fade. The practice of medicine and surgery is not an exact science. Although good results are expected from scar revision, there is no guarantee, In some situations it may not be possible to achieve optimal results with a single procedure and another surgery may be necessary. Contractures: Scars that restrict movement due to skin and underlying tissue that pull together during healing. Usually occur when there is a large amount of tissue loss, such as after a burn. Excision: Surgical removal of a scar. General anesthesia: Drugs and gases used during an operation to relieve pain and alter consciousness. Keloids: Large scars that can be painful or itchy and may also pucker. Can occur anywhere on the body, developing more commonly where there is little underlying fatty tissue, such as on the breastbone or shoulders. Laser resurfacing: A minimally-invasive laser treatment that removes damaged surface skiin, allowing health new skin to form at the scar site. Skin grafts: Healthy skin taken from other areas of the body, such as the abdomen or thigh, to revise a scar. Tissue expansion: A procedure that can substitute for skin grafts. An inflatable balloon called a tissue expander is placed under the skin near the scar site to stretch additional skin to be used to revise a scar. Multiple procedures are often needed. 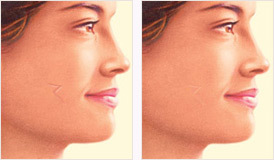 Z-plasty: A surgical technique that creates angled flaps on either side of the original scar site that can completely reposition or change scar direction, interrupt scar tension or improve scar flexibility. Scar Revision at Hedden & Gunn Plastic Surgery minimizes the appearance of scars to make them more consistent with the surrounding skin. To learn more about Scar Revision procedures at Hedden & Gunn Plastic Surgery, please contact our Birmingham, Alabama plastic surgery center today.